The focus of this article is not on the detailed biochemistry or anatomy of scar formation but more on the general scar types and effective treatments on the market today. What is a scar? The American Academy of Dermatology defines it simply on their website, "A scar is a mark left on your skin after an injury heals." 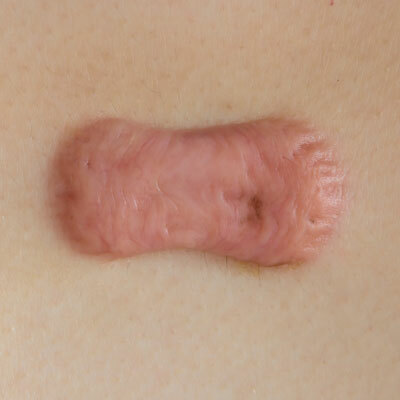 To be a bit more specific, a scar forms, in general, when the dermal tissue is affected. 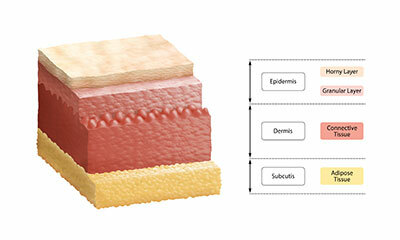 Remember the general structure of skin (figure 1). 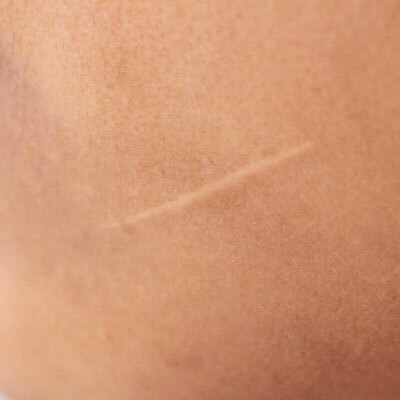 A scar may form when the epidermal/dermal junction (EDJ) is damaged and the dermal tissue is penetrated. This penetration can be a result of a puncture, incision, chemical, heat or any mechanical penetration. The skin reacts by starting the healing process (the body protecting itself). High levels of collagen and elastin are produced to rebuild the tissue in that area. A biochemical cascade starts flooding the area with healing agents in specific sequences. Depending on the depth and type of injury, the resultant scar can be quite minor or significant. There are many types of scars, including flat scars, keloid scars, hypertrophic scars, atrophic scars and contracture scars, which are generally caused by burns. Flat scars are the most common type of scar that occurs from the normal healing process. Rapid collagen and elastic formation occurs in the affected area causing a visual defect in the skin area. These types of scars can resolve quickly or take a year or so to improve completely. Skin pigmentation affects the scar outcome as well. For Fitzpatrick III skin types and above, the affected skin area often becomes more highly pigmented than the surrounding skin making the appearance of the scar more pronounced. Post-inflammatory hyperpigmentation may also arise in these skin types making the appearance of the scar even more visible. Hypertrophic scars are scars which tend to overproduce the repair substances of collagen and elastin making the resulting scar appear to be raised. 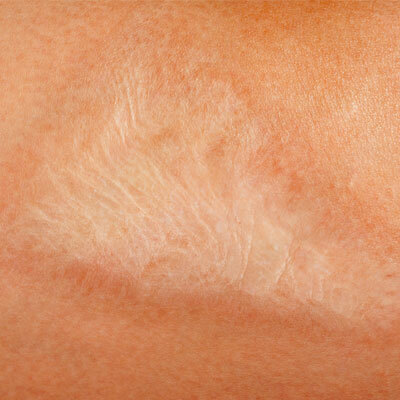 Often the scar will thicken with age and have a highly textured surface. The pigmentation issues associated with scars previously mentioned can also be associated with hypertrophic scars. Keloid scars also exhibit similar behavior in that they overproduce collagen and elastin as a response to an injury to the skin. Keloid scars, however, may become larger than the wound site and continue to grow. Pigmentation in keloid scars can also be more visible due to the size and scope of the scar. Atrophic scars are scars which have a sunken or pitted appearance as a result of tissue loss from the original injury. This tissue loss may be as a result of the actual tissue damage at the site or loss of underlying fat or muscle. Often times these scars are as a result of acne. Finally, contracture scars are a typical result of burns to the skin tissue. These can be minor to extremely significant sometimes resulting in substantial restriction in movement and mobility of the patient. As soon as the wound closes add active ingredients which accelerate wound healing, particularly the initial stages of granularization. The more quickly local inflammation is reduced and repair ingredients are added to the site of injury, the better the scar result will be. Keeping the dermis and epidermis well hydrated with humectants (water attracting ingredients, such as glycerin or hyaluronic acid) and occlusive hydrators (traps water in the skin, such as dimethicone) will significantly help in scar recovery and optimization. For Fitzpatrick III skin types or higher, be aware of post-inflammatory hyperpigmentation. It may occur up to two weeks after a skin injury. If observed immediately, a skin lightener applied to the area can slow down the production of melanin in the skin. Hydroquinone is best in this case. If you do not do this, lasting hyperpigmentation may persist for quite some time. Peels: Unbuffered glycolic peels are best for flattening tissue. You will want a solution pH of 2 or less. Microneedling: You will want to be from 1–2 mm into the skin tissue to be effective. Use a post microneedling serum, which contains ingredients with matrix metalloproteinases to reduce the collagen and elastin in the affected area. You do not want to further injure the area to induce more collagen and elastin to be made in the area! Microdermabrasion: This technique helps slightly but only when used in combination with other techniques. Dermabrasion is effective but is generally done by physicians and can have downtime associated with it. LED light: Some have advocated LED light, but I have not seen this as effective for scar remediation. Lasers: This is a tricky one. Remember, we want to reduce the tissue in the area to flatten the scar. If we use a high-heat laser, which also fractionates the skin we may be inducing the skin to make more collagen and elastin. For the initial procedure’s an ablative nd:YAG is a good choice. These lasers remove skin tissue at the surface without leaving much of a heat signature in the skin. CO2 lasers, in this case, would not be a good choice since they heat the skin deeply. Keloids should be treated in the same way as you would treat hypertrophic scars. The exception is that if the scar starts to exceed the original boarders of the wound, you may want to refer your client to a physician for further evaluation. Be aware of the pigmentation issues with Fitzpatrick III’s and higher with keloids. Pigmentation can be an issue and you should manage it carefully. You have exactly the opposite challenge with atrophic scars. With scars that are sunken or pitted, the object is to “even out” the depth of the scar. It is the depth that makes the scar visible for the most part. There are two approaches to this: remove skin to reduce depth, or plump skin to reduce depth. Ideally, you want to do both. Contracture (burn or underlying secondary issues) scars are very difficult to manage. The same approach should be taken in any case assuming these scars are stable and a physician is involved. In more serious cases, returning some measure of mobility and movement to the skin may be enough to provide some relief. In this case, microneedling high molecular weight hyaluronic acid and biopeptides along with topical skin lubricants is an option here. If laser fractionalization is considered, ensure the primary physician is involved in the decision-making process. As you can see, there are options with regard to scars which have not typically been available in past years. The key to successful scar remediation is to use a variety of relevant techniques to achieve realistic and acceptable solutions for your client or patient. Knowledge of how scars form, the type and their progression is critical in good scar care.